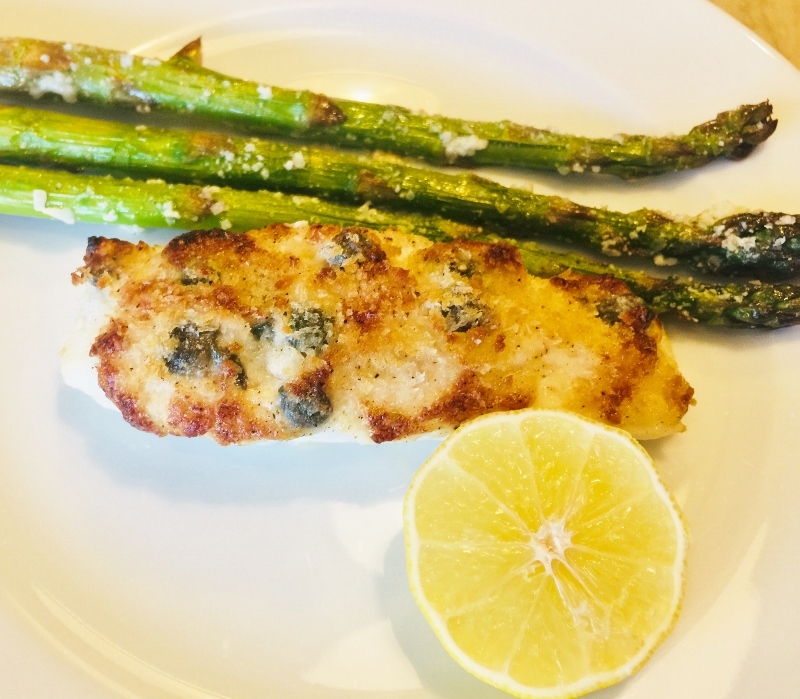 Crunchy, Creamy, Caper Halibut - Recipe! - Live. Love. Laugh. Food. 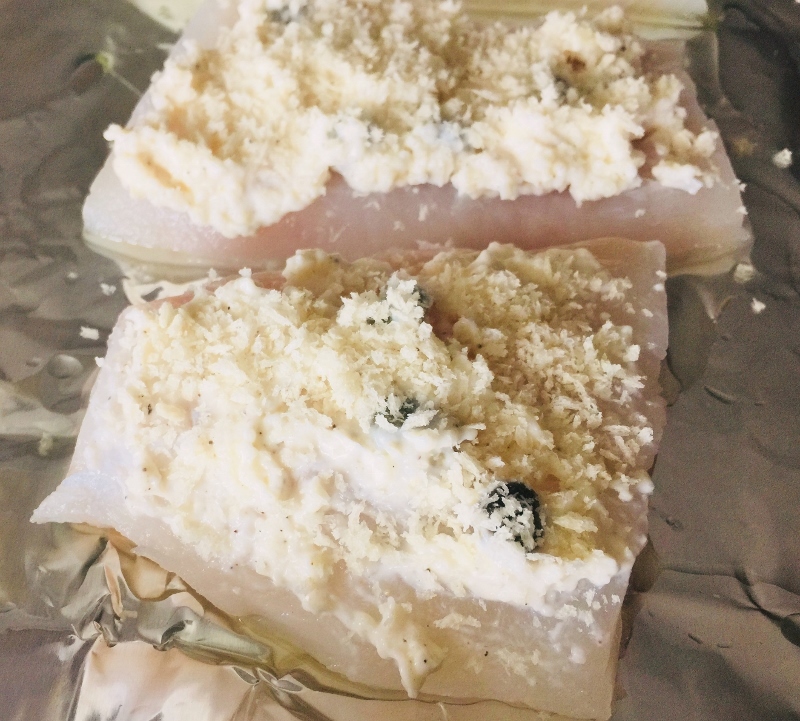 Crunchy, Creamy, Caper Halibut – Recipe! Yes, I know the title is a little much, but that’s exactly what you experience when you take a bite of this halibut recipe. Halibut is one of those fish that even the pickiest of eaters tend to enjoy because of its mild flaky texture. The trick to making great halibut is to not overcook it, so you don’t lose the delicateness of the fish and I am here to help. We were raised eating all kinds of fish, however when we were real little, halibut was definitely our jumping off point. 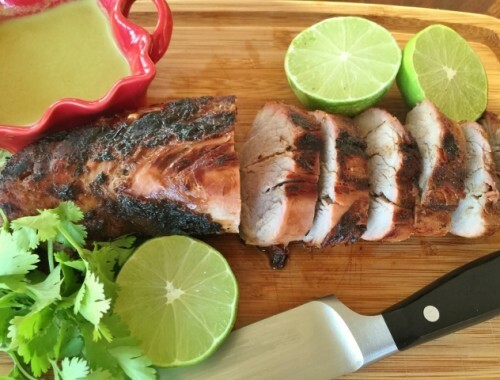 Sometimes we grilled our fish in the backyard, while other times – a quick roast in the oven on a sheet pan. My mother really exposed us to good healthy food at a young age, and even though my brother was a little challenging (peanut butter sandwiches only for a few years), she kept exposing us to fresh ingredients, especially fish. In this fish recipe, I start by adding light mayonnaise, tangy capers, grated parmesan cheese and a pinch of black pepper in a bowl. The entire mixture is spread on top of each fillet, and then sprinkled with panko bread crumbs and a pinch of salt. 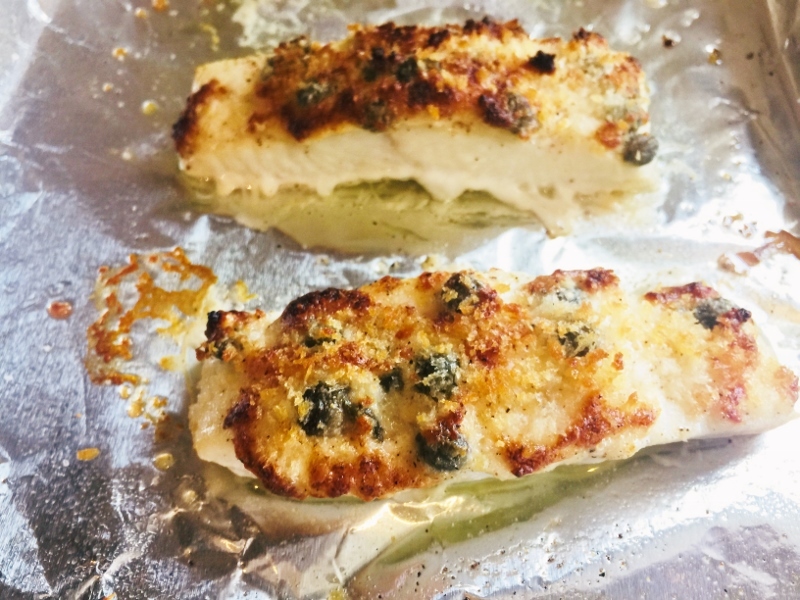 After roasting in the oven for 8 minutes, I crank up the broiler and cook for another 2 minutes – there you go Crunchy, Creamy, Caper Halibut. What’s so lovely about this dish is that the interior is super moist, while the top has a delicate crunch. I like to serve it with some roasted asparagus, which you can place in the oven at the same time as the fish, and everything will be done at once. 1. Preheat oven to 400 degrees. 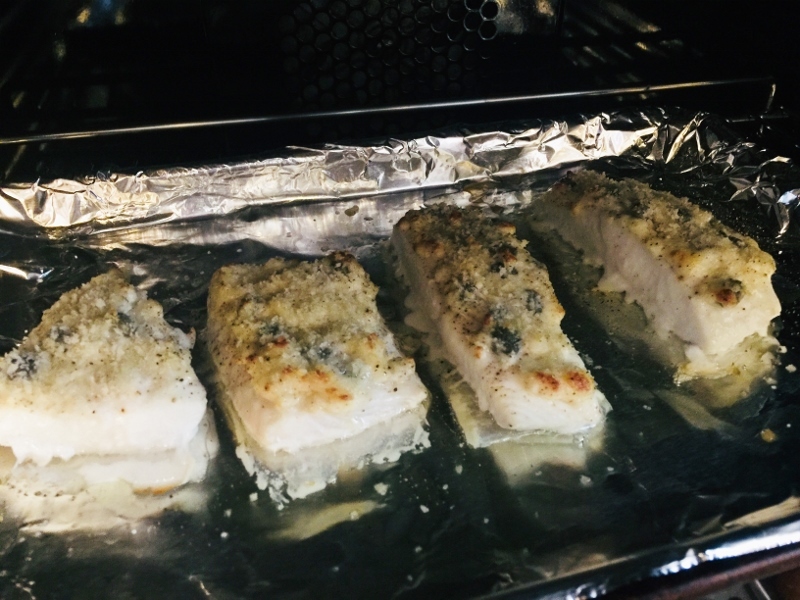 Place halibut fillets on a sheet pan covered with aluminum foil. Pat fish dry. In bowl, combine mayonnaise, parmesan, capers and black pepper, stir. Spread caper mixture on top of each piece of fish. 2. Sprinkle each fillet with bread crumbs and a bit of salt. Drizzle tops with oil and place in oven to cook for 8 minutes. 3. Turn heat to broil and cook for 2 minutes, or until the tops are golden brown. Serve with your favorite veggies. Enjoy! 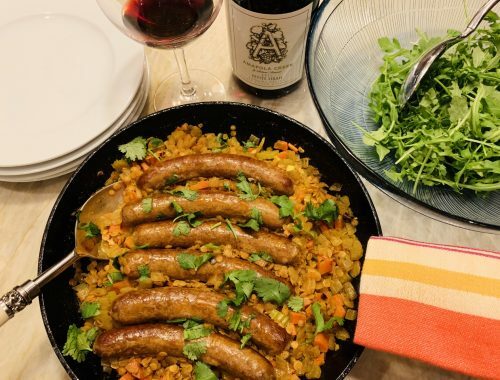 Skillet Lamb Sausage and Curried Red Lentils – Recipe! 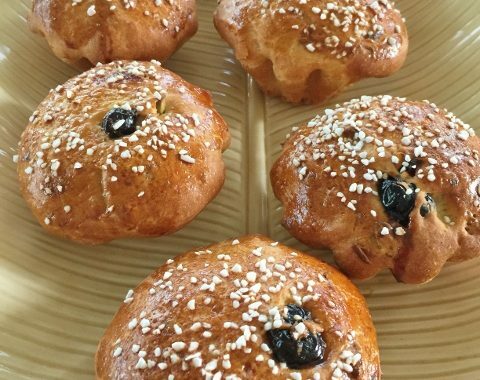 Citrus Pistachio Brioche – Recipe!